An astrophysicist searches for his wife in the stars. As the cosmos unfolds, the birth, life, and death of a star trace the couples loss of their child. 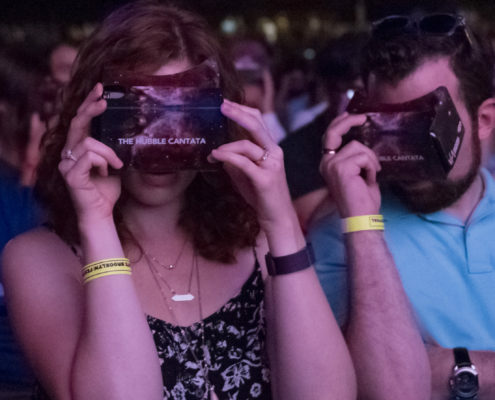 With stunning images from the Hubble Space telescope, the space-inspired cantata culminates in a five-minute virtual reality film that launches the audience into an immersive voyage through the universe. Starring Nathan Gunn and Jessica Rivera. Written by Royce Vavrek, Film by Eliza McNitt, conducted by Julian Wachner. Through his narration, New York Times best-selling author and eminent astrophysicist Dr. Mario Livio explains the larger celestial implications at stake, placing the characters’ story within the grand scheme of the cosmos. 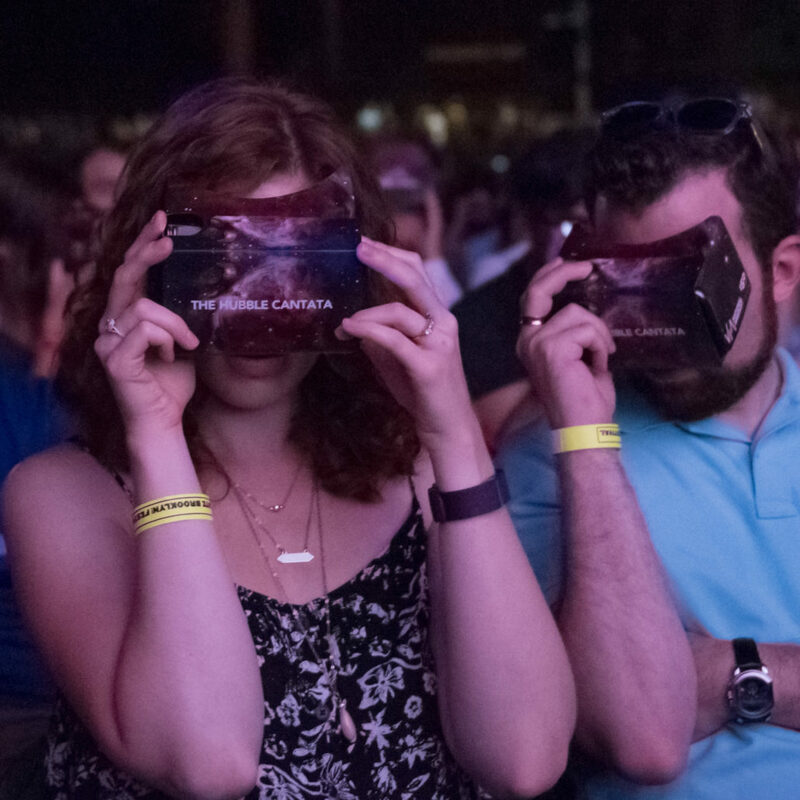 In a final gesture, this family-friendly performance incorporates virtual reality cardboard headsets, simulating an immersive voyage through the universe, expertly created by The Endless Collective, a leading VR FX firm, with a 360-degree soundscape developed by Arup, the global leaders in acoustic and sound design. 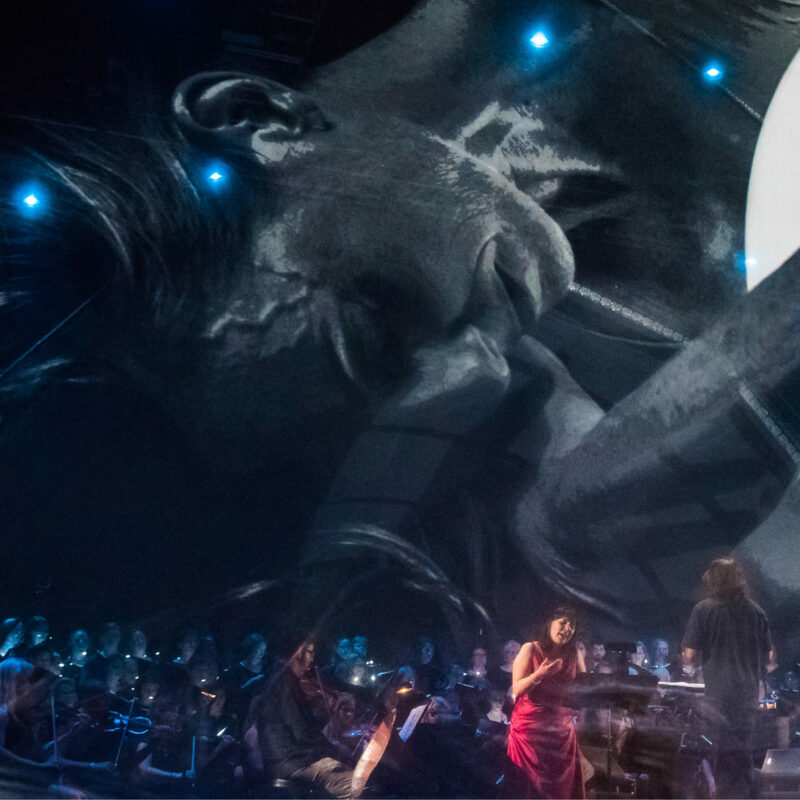 This mesmerizing live experience, co-produced by VisionIntoArt/National Sawdust, Beth Morrison Projects and Arup, reflects Livio’s poignant themes and the powerful realization that humans discovered, explore, and continue to expand the understanding of the universe, and man’s place in it. Commissioned by Jill Steinberg. Original commission by Bay Chamber Concerts for A New Frontier 2013. 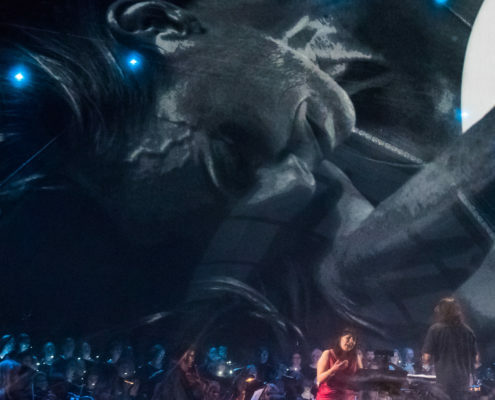 The Hubble Cantata is supported in part by generous individual donors, Time Warner Inc. in collaboration with 150, an award from the National Endowment for the Arts, public funds from the New York City Department of Cultural Affairs in Partnership with the City Council, and by the New York State Council on the Arts with the support of Governor Andrew Cuomo and the New York State Legislature. Her footsteps tell stories. The astrophysicist seeks those stories now. His wife walks in patterns, pictures emerge in the soil, the dust. 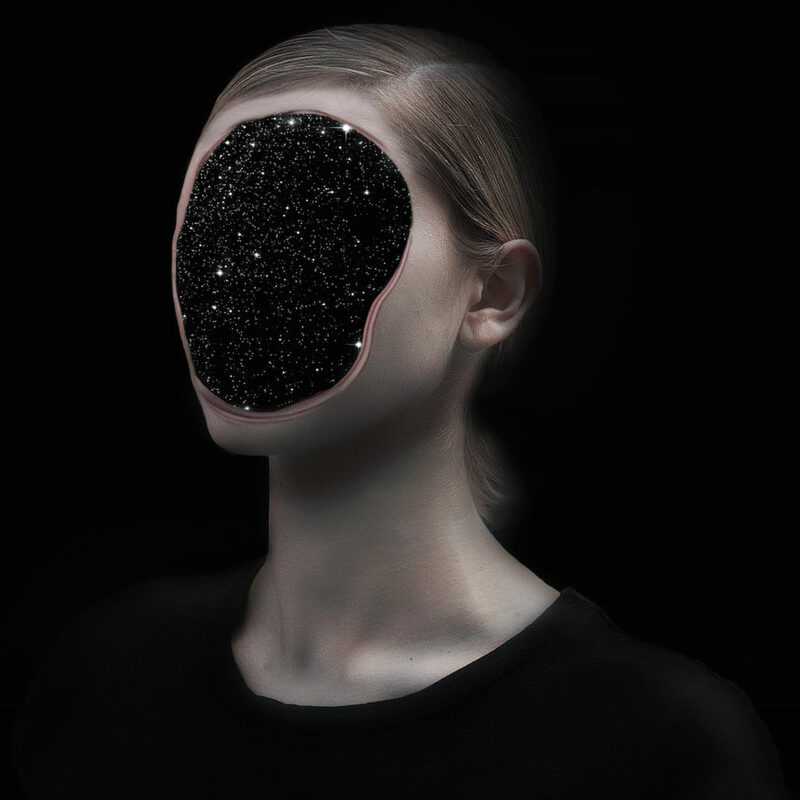 Hers is a story of gravel, of constellations, grief for their lost children. She creates her own private Nazca Lines, tattooing the earth with an exit strategy. Exhausted, she collapses in the darkness of night, with only space’s infinity to nurse her. In the black sky canvas, a single star is born, a sphere of gas and gravity. She coaxes it to life, asking the newborn to declare its intent to outlive her. As she sleeps a great wind sweeps clean the soil, the lines she has drawn erased in a grand gesture. With no lines to bring her home, the woman latches onto the ribbon of dying star, ascending to the heavens, awaiting the birth of a new star. She spends her new life in the heavens acting as a midwife. We come into the story years later, after the death of their child and the suicide of his wife, when the astrophysicist attempts to trace the faded remains of his wife’s path to the stars. He has come to collect her in a plea for forgiveness, understanding he was complicit in the tragedy. He wonders if his wife would recognize him as a much older man. Will the lines of age render him obscured? Will she have found love in another galaxy? He leaps from galaxy to galaxy desperate to be reunited. 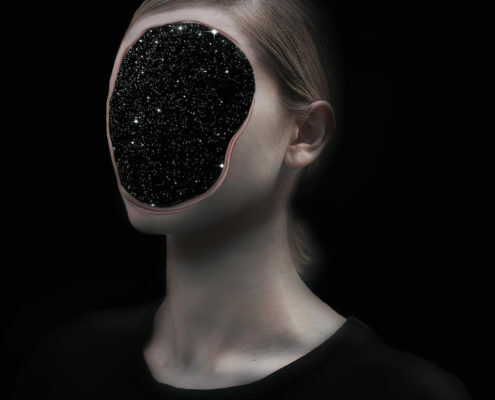 Unable to find her in the multiverse, the truth about her whereabouts is locked inside a photo taken by the Hubble telescope. 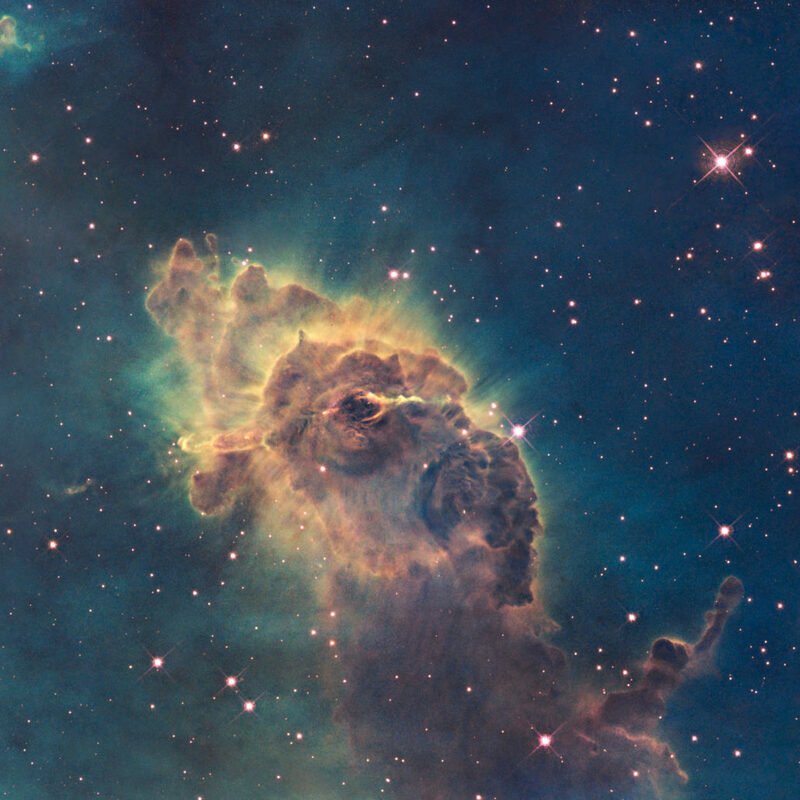 As Hubble’s service comes to an end, it hurls back to the earth. The astrophysicist runs to the telescope’s ocean grave collecting the shards from the wreckage, with hope that the remains might contain a portrait of his missing wife. 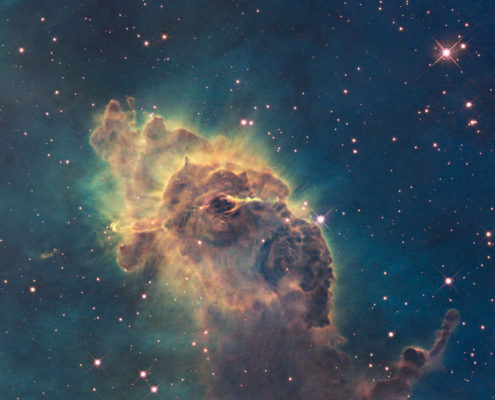 After seeing her image one last time we step back into his earthbound life and his studies, as he guides us through extrasolar life and one last view in 3D of the Orion Nebulae and all his findings. The Hubble Cantata received its World Premiere on August 6 at the Prospect Park Bandshell, as part of the BRIC Celebrate Brooklyn! Festival.